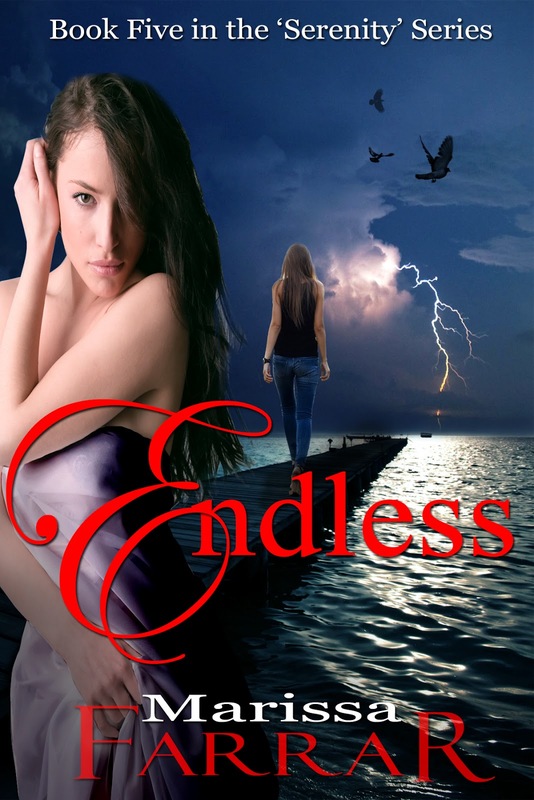 Marissa Farrar: Sneak Peek of 'Endless' Book Five in the Serenity Series! Sneak Peek of 'Endless' Book Five in the Serenity Series! The big day is almost here! although the official release date is the 2nd of May, I'm expecting 'Endless' to go live any day now. Exciting! To keep you all geared up for the new book, here is the first chapter. Enjoy! On the morning of her thirteenth birthday, Elizabeth opened her eyes and immediately squeezed them shut again. Sunlight pierced the room like slants of light glinting off a blade, spiking through her brain. The pain started behind her eyes and spread, culminating right where her skull joined her neck. She groaned and picked up her feather pillow, clamping it down over her head. What the hell? Had her mom come in and opened the drapes or something? She edged the pillow off her head and risked opening an eye. The light was still painfully bright, but she could see the drapes were drawn. From downstairs, pans clanged and clashed like symbols—her mom making breakfast. What the heck is she making so much noise for? Each bang and crash hurt her ears, as though the pots were being hit right next to her head, making her wince, her head pounding. The pain ballooned behind her eyeballs, as if her brain had swollen during the night and was now trying to force its way out of her head. And something else was different. She shifted in her bed. A wet stickiness was between her thighs, gluing her underwear to her body. A dull cramp seized her abdomen, twisting her guts, and she groaned, curling in on herself. The agony was enough to make her forget her headache for the moment. “Mom!” she called out as the pain subsided. Tentatively, she placed a hand between her legs. She knew what she’d see before she even brought her hand back into her line of vision. She’d smelled the metallic tang of blood the moment she’d woken. However, the sight of red on her fingertips stirred a mixture of emotions inside her—uneasiness combined with a strange kind of excitement. This was her first time; she’d finally left her childhood behind her. Her mother’s footsteps were like a drum pounding on the hallway floor toward her room. Elizabeth pressed the pillow closer to her head, trying to drown out the sound. Her bedroom door cracked open and fresh streams of light burst through the gap, like sunlight catching on snow. Serenity’s head poked through, a smile on her still youthful face, a result of the vampire blood she took each month. Her mom didn’t look a day over twenty-eight, something Elizabeth thought people would start commenting on soon enough. Even living in Los Angles, people would figure out that the best of plastic surgeons couldn’t leave someone looking that good. “I got my period,” Elizabeth replied, her voice a mumble in the pillow. The warmth of her mother’s hand made contact with her back, rubbing between her shoulder blades in slow circles like she had done when Elizabeth was small. “It means you’re not a little girl anymore. You’re becoming a young woman. “Has Dad called yet?” Sometimes he called really early, before it got light. “’Kay.” Elizabeth didn’t doubt that her father would call. Even after what had happened, he’d done everything he could to stay in touch with her—calling every day, sending her presents from all over the world. It wasn’t the same as having him around—of course it wasn’t—but she knew the reason for him not living with them had nothing to do with him not loving her. She remembered that day, all those years ago, when he’d hurt her old nanny, Bridget. When he’d killed Bridget. The thought still managed to twist something deep inside of her, a pain she’d never come to terms with. She’d loved Bridget, but she loved her father too. She knew what happened hadn’t been his fault, but didn’t make the horrible fist in her guts go away. When she’d been younger, she hadn’t understood his reasons for leaving quite so easily. She remembered being so angry at first, angry and impossibly sad at everyone, including herself. Sebastian had left because he was frightened of hurting her, or of someone else using him to hurt her. Elizabeth had been mad with herself for being so fragile, feeling as though she’d driven him away somehow simply by being as human as she was. She’d also been angry with her mother for not fighting harder, for taking her father’s point of view. For a long time, she’d been the angriest with Sebastian for doing what he had and for leaving them alone again. But that had been years ago now, and those earlier emotions had long since started to fade. Elizabeth climbed out of bed and checked her sheets. Streaks of dark red marred the cream cotton. With a sigh, she reached across the bed and picked up her pillows and duvet, throwing them to the floor. Then she stripped off the stained sheet and bundled it into a ball before dumping it in her laundry basket. Her closet held a change of bedding, so she forced herself to pull out a clean sheet and remade her bed, trying to ignore the pounding in her head, knowing she’d want to climb right back in again after she’d cleaned herself up. She made her way to her bathroom, grabbing a change of clothes on the way. The smell of blood seemed to fill the room, making her stomach churn in an uneasy way. God, if it was going to be like this every month, she’d never be able to leave the house. She’d be too damned embarrassed, never mind how awful she felt. As if in reaction to her thoughts, her lower abdomen cramped again and she stopped to clutch at the bathroom door frame. She bent double, waiting for the pain to ease. No wonder this was called the curse in the old days. She pushed the door shut, closing out the painful light streaming in through the drapes on her bedroom window. Thank goodness there are no windows in here. Her whole body seemed to sag with relief, the pain in her head dimming to a dull ache. She removed her clothes and threw her ruined underwear into the small silver trash can under the sink. They were beyond saving. She turned on the shower and stepped under the hot spray, swirling the blood in a diluted pink around her feet. She sighed again. How typical for her to feel so crappy on her birthday. She had plans with her friends to head to the mall later to grab something to eat—with her mom promising to only lurk in the background and not sit with them—and she’d been looking forward to being a proper teenage girl. Now, she only wanted to climb back into bed and stay there. Feeling cleaner—though still with a pounding headache and an ache in her belly like someone had punched her—she climbed out of the shower and carefully dried off on a clean towel. She normally loved the thick white towels, but now wished they were a different color. She didn’t want to make a mess of them as well. A number of girls in her class had already gotten their periods and her mom had stocked her medicine cabinet in expectation of the event. She was grateful for that now, not needing to suffer the extra embarrassment of having to ask for sanitary products. Elizabeth dressed in clean underwear and a t-shirt, not bothering with any pants. She certainly didn’t intend on going anywhere just yet. She opened the bathroom door and squinted once more against the painfully bright light. She turned her face away and lifted one arm to shield her eyes. What the hell is going on with the sunlight today? It might be spring in L.A., but she felt like she was dealing with the sun in the middle of the desert. She found herself wishing they’d not had the blackout blinds removed after Sebastian left. On top of dealing with the light, the scent of bacon frying drifted up the stairs, pungent and overwhelming. The scent made her stomach churned, bile rushing to the back of her mouth, her throat closing over. Jeez, what’s mom cooking? The food smelled off. She crossed the room and stopped to scowl at the window and the painful shards of light that managed to pierce through the drapes. Moving quickly, she grabbed the soft, chenille throw from the bottom of her bed and clambered onto her dresser to throw the blanket over the top of the drapes. Immediately, the level of light dropped and her pounding head began to subside. More slowly, she got down and climbed back into bed, sliding beneath the soft sheets and curling up on her side. Her mother’s footsteps clomped back along the hallway, sounding as if she were wearing bricks strapped to her feet, and a moment later the bedroom door opened. Serenity walked in, a tall glass of water clutched in one hand and a small bottle of pills in the other. Elizabeth made a retching face. Elizabeth popped one of the pills in her mouth and chased it down with the water, knocking her head back to get the medicine down. It left a bitter taste in her mouth. She didn’t like having to take medication. In fact, she couldn’t even remember another time when she’d needed to. Rarely, if ever, did she get sick. She sensed her mother’s surprise. Normally, she was so eager to get her hands on anything her father sent her. Sometimes he mailed her funny things from foreign countries, like menus with bizarre English translations, things he knew would make her laugh. But other times, he sent her precious things—hand-dived pearls from Tahiti or beautiful green stone from New Zealand. Wherever he was in the world, she knew he was always thinking about them. Even though she always wanted Sebastian around, she had to admit life had been much quieter since her father left. No one had been kidnapped, hurt or threatened. For the most part, anything paranormal had stayed away. Even her visions had calmed down, making it easier for her to fit in, though she still wasn’t exactly the most popular girl in school. With her porcelain skin—which burned so easily in the Los Angeles sunshine—and her shock of dark hair, she was a far cry from all the blonde, honey-skinned girls that seemed to make up the cool-kid crowd. Still, she had her little group of friends and she was happy with that. Her mother bent over her, pressing her warm lips against the top of Elizabeth’s forehead—the only part of her face still exposed. Though she wouldn’t admit it out loud, she was glad her mom was here to look after her. They’d all struggled over the past few years, her mom as much as anyone. Elizabeth knew Serenity missed Sebastian, but she also knew her mother wasn’t totally alone. Vincent, the vampire Elizabeth still struggled to think of as Bridget’s son, came around occasionally. It was normally late at night and her mom thought she’d kept his visits a secret, but Elizabeth heard them speaking in low, serious tones from the living room. Elizabeth wasn’t stupid, she was perfectly aware the big vampire wanted more from her mother—something she didn’t intend on giving too much thought to—but she also recognized the affection and longing in her mother’s voice whenever she overheard her mom and Sebastian speaking. Her mom wouldn’t tell her dad that she missed him and not mean it. With the pillow still over her head, she didn’t see her mom turn from the bed. The click of the door came, signaling her leaving. Elizabeth closed her eyes against the world that had suddenly become too bright and too loud and allowed herself to drift off to sleep. Happy Days! Amazon Overseas Tax Issue Sorted!